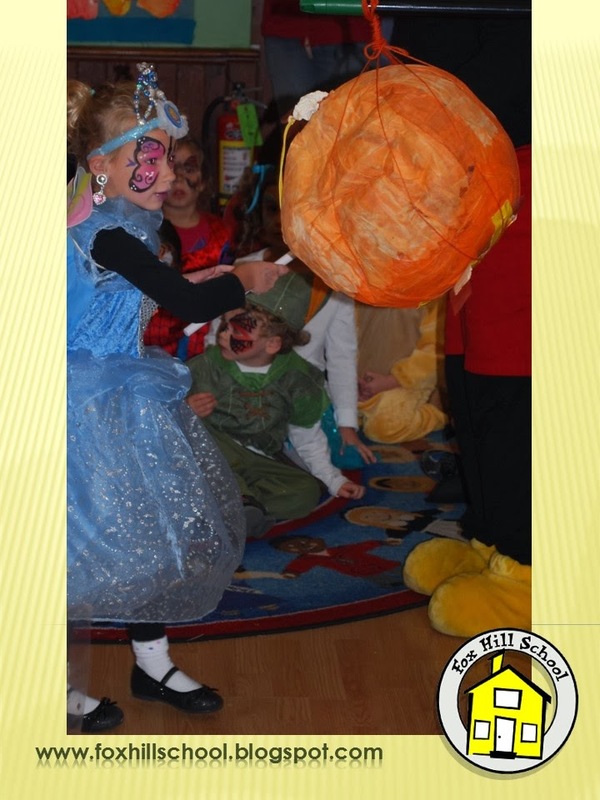 Each year we make a paper mache pinata with the kids for our Halloween Spooktacular. This summer in my art class from Deep Space Sparkle I learned of a great paste to use instead of glue/water or flour/water (which are soooo messy). Elmer's Art Paste worked great for our pinatas this year. I also learned to do the final layer with paper towels so the newsprint doesn't show through. Ms. Amy had the fabulous idea to add liquid watercolor to the paste for the final step so we didn't even need to paint them this year! You may be thinking that having a pinata with preschoolers sounds a bit chaotic, but we've solved that problem too! Ms. Tricia had the genius idea that we put ziplock bags (to match the exact number of kids) pre-filled with goodies into the pinata. Then once the pinata is broken, treats don't fly everywhere and there is no fighting because every child gets one equal bag of goodies! So much fun without the craziness! Needless to say, our amateur "red heart" or "rainbow" facepaint will never cut it again! The kids were beside themselves - she does such an amazing job. 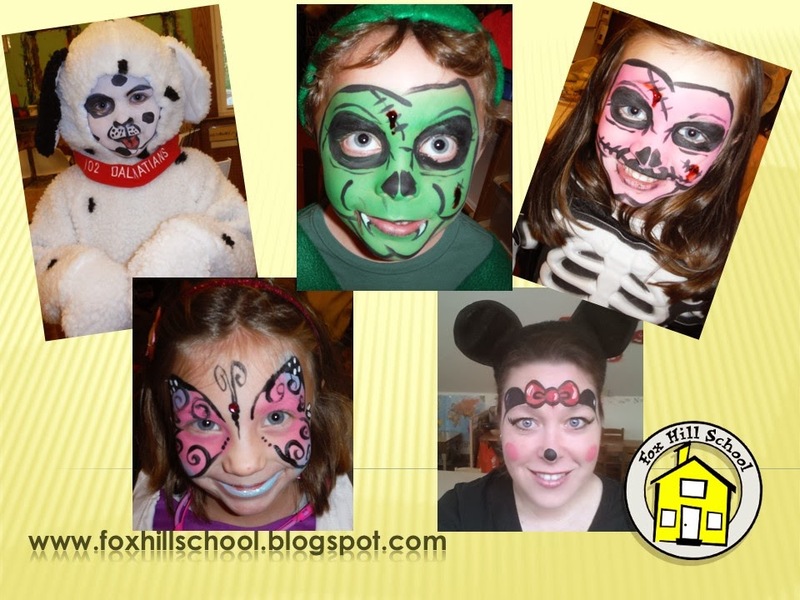 If you live in the area and are looking to have face painting at an event be sure to call Judianne. Check out her website at http://www.moorecolour.com/Face-paint-gallery-and-pricing.html. She also made a fabulous mural for our playground this summer. A truly talented woman and we appreciate all she does for us! My kids wanted to give their teacher a little something for Halloween so we made some Boo-nana Bread! 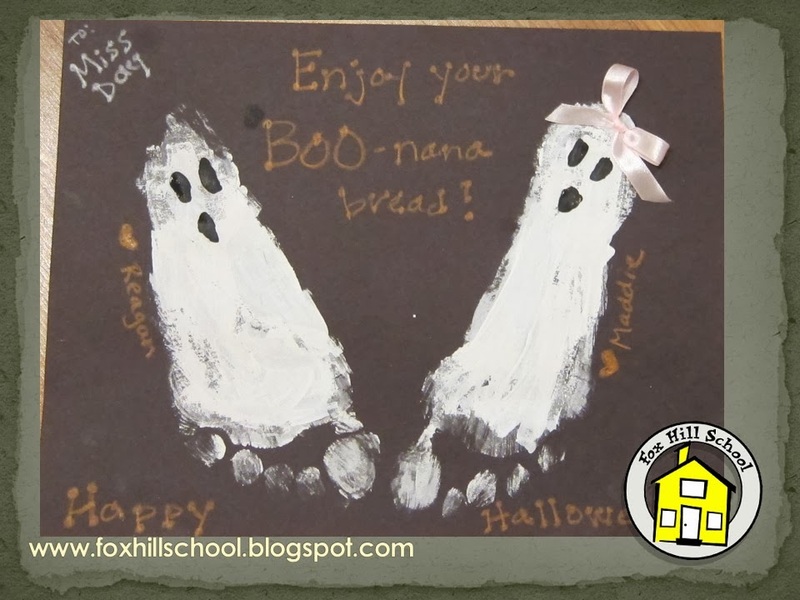 It's just regular banana bread but we accompanied it with this cute card we made by painting their feet and making them into ghosts! Cream together butter and sugar. Add one egg at a time, beating until smooth. Blend in mashed bananas. In second bowl, stir flour with baking soda, baking powder, salt and nuts. Add to banana mixture stirring only to moisten. Transfer to greased loaf pan. Bake in 350 degree oven for about 1 hour until inserted toothpick comes out clean. Let stand 10 minutes. Remove from pan and place on cake rack to cool. Wrap to store. This recipe makes 1 loaf. 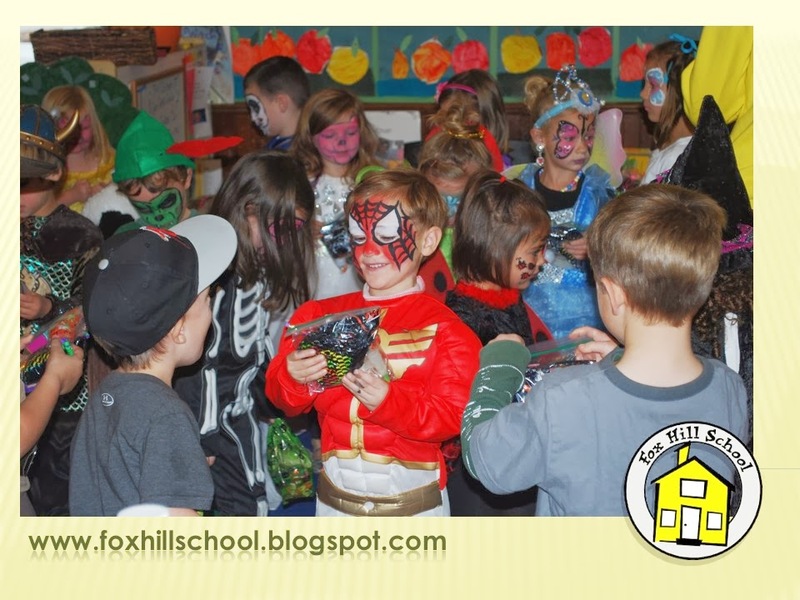 As I mentioned in my post on September 30th, we were planning a Family Literacy Night (an idea I got from an online class I took from Fairy Dust Teaching this summer). Well, we held our event last week and it was AMAZING (if I do say so myself!) One of my son's friend's dad, Paul Czajak, just wrote an awesome new children's book called Monster Needs a Costume and we used that as our theme for the Family Literacy Night. 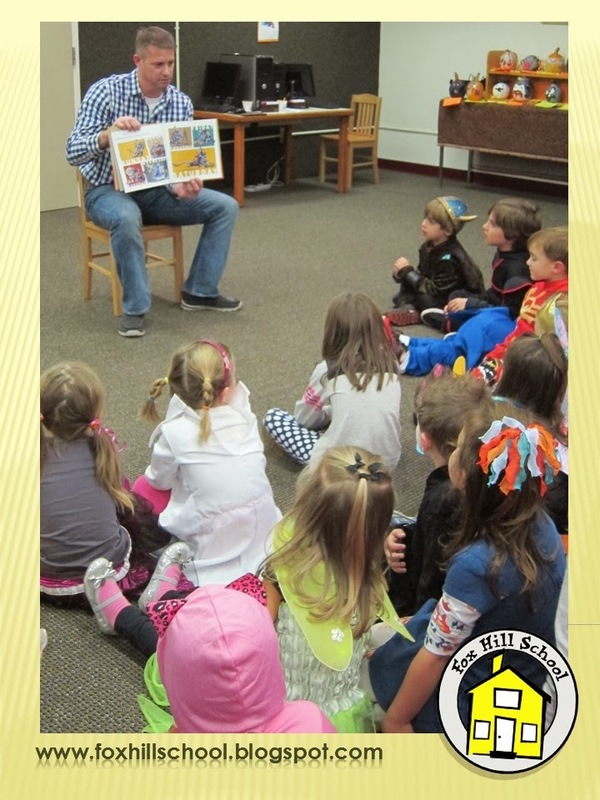 The kids were encouraged to wear their Halloween costumes to the event and Mr. Czajak came and did a reading of his story and signed copies of his book for our kids. 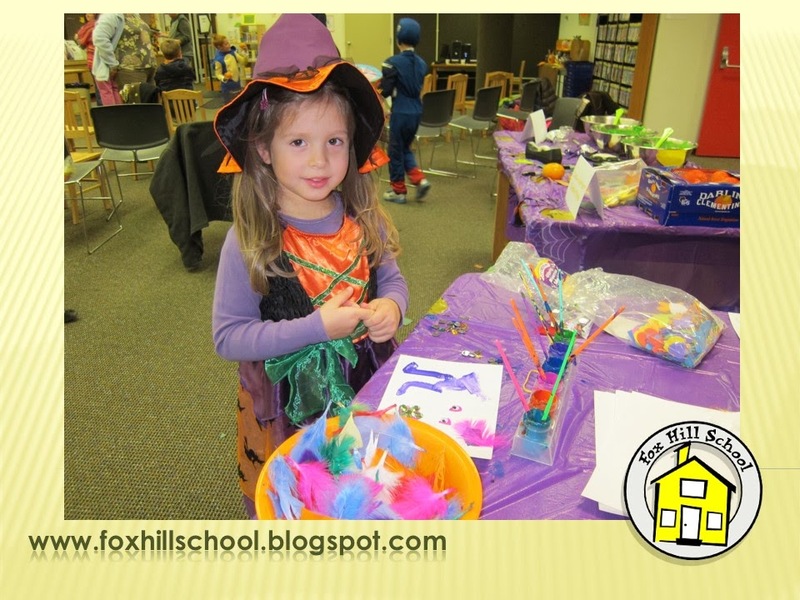 Then we had all sorts of monster-themed activities for the kids to do with their parents. I'd like to say I thought up all the activities myself but it was truly a Pinterest inspired evening! 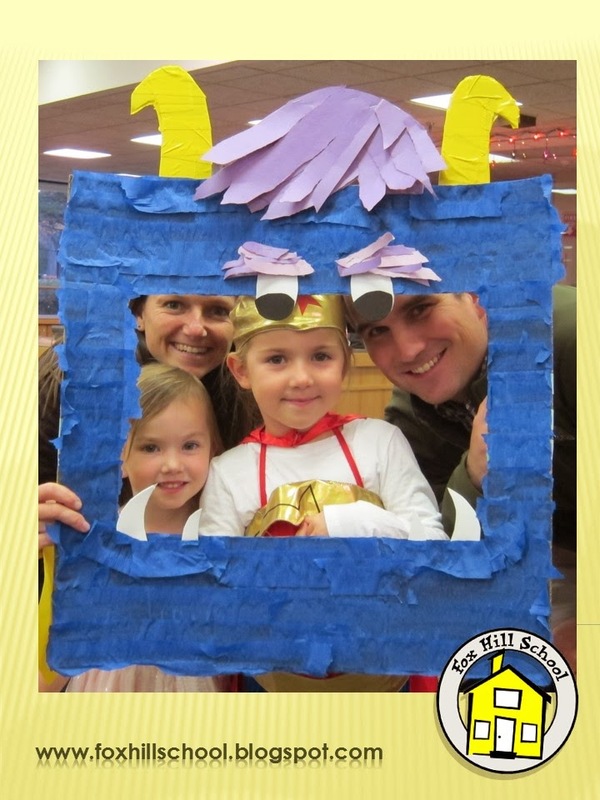 As families arrived at the event, we took their pictures in the frame that looks like the monster in the book. So awesome Ms. Amy! 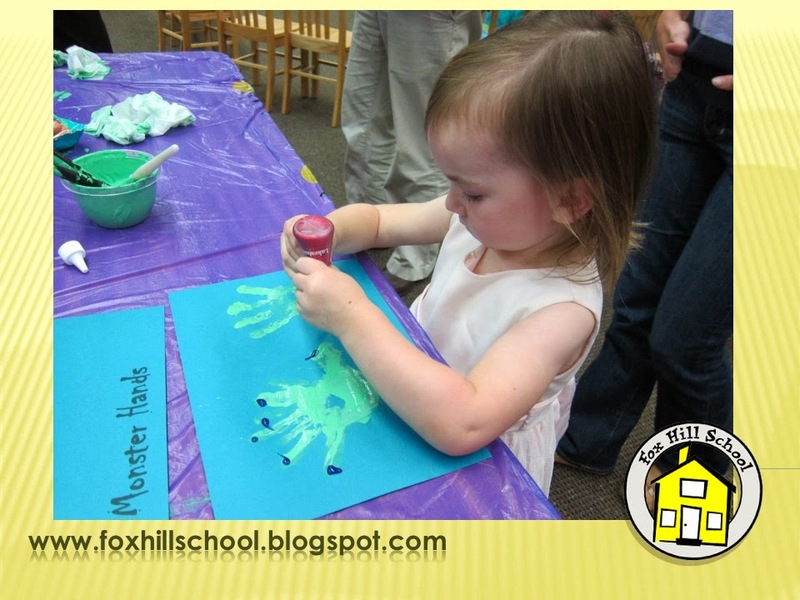 The kids made hand prints with green tempera paint and then added glitter glue to the finger tips to make them look like monster hands. 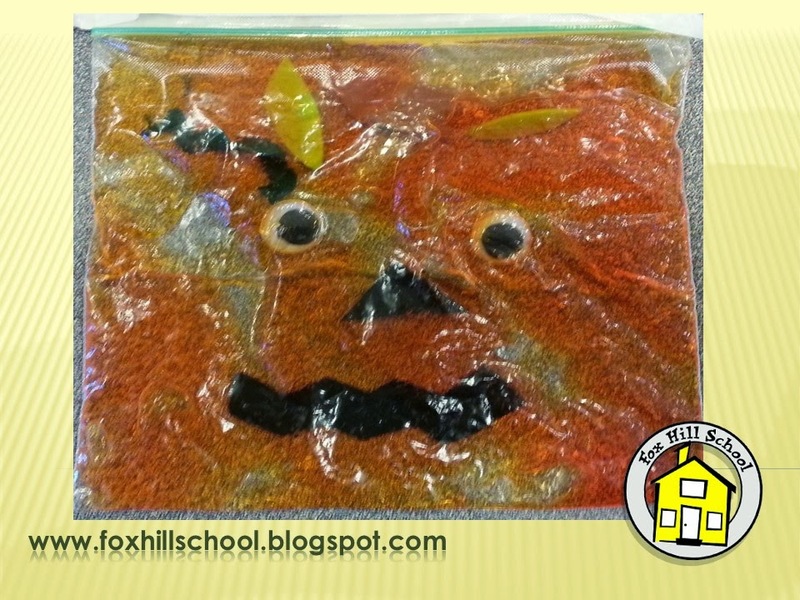 The activity I saw on Pinterest was a squished witch, but my daughter thought that too scary for the preschoolers so we made it more preschool friendly and made Jack-o-Lantern squish bags! Ziplock bags filled with googly eyes, piece of ric-rac (for tendrils) and foam pieces in the shapes of leaves, stems, nose and mouth. The kids pick what they want in their bag and then add hair gel colored with liquid watercolors. We provided clear cups and Sharpie markers. 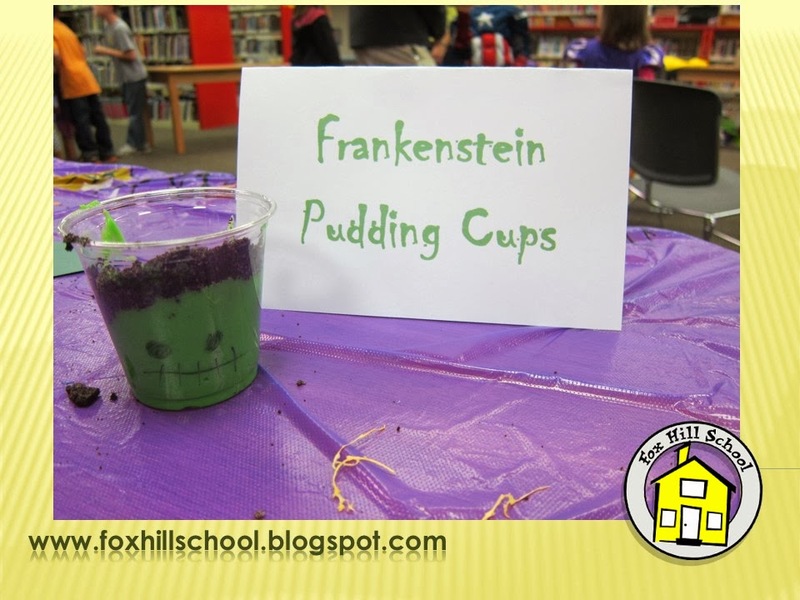 The kids added eyes and a scary mouth then filled their cup with vanilla pudding colored with green food coloring. Then they added crushed Oreos for the hair. 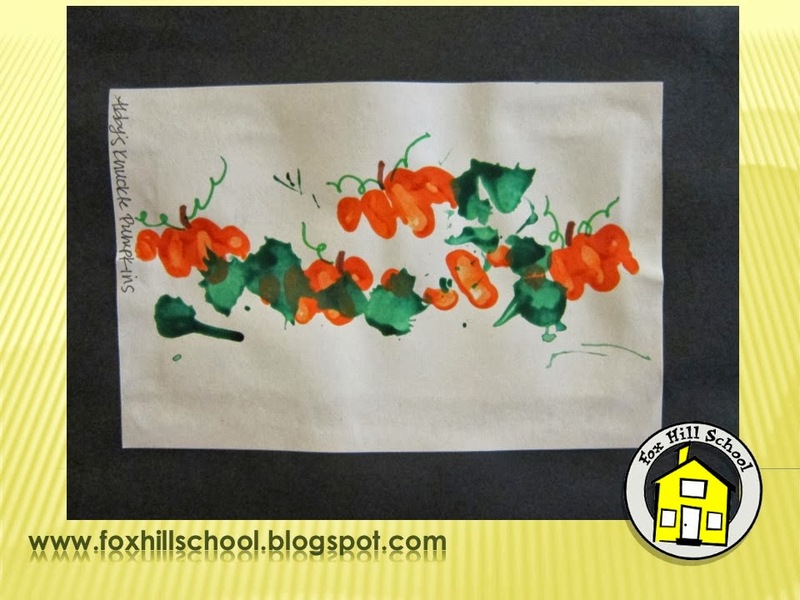 We added glue to tempera paint (to cut out one step of the process) and had the kids splat paint on one side of paper. 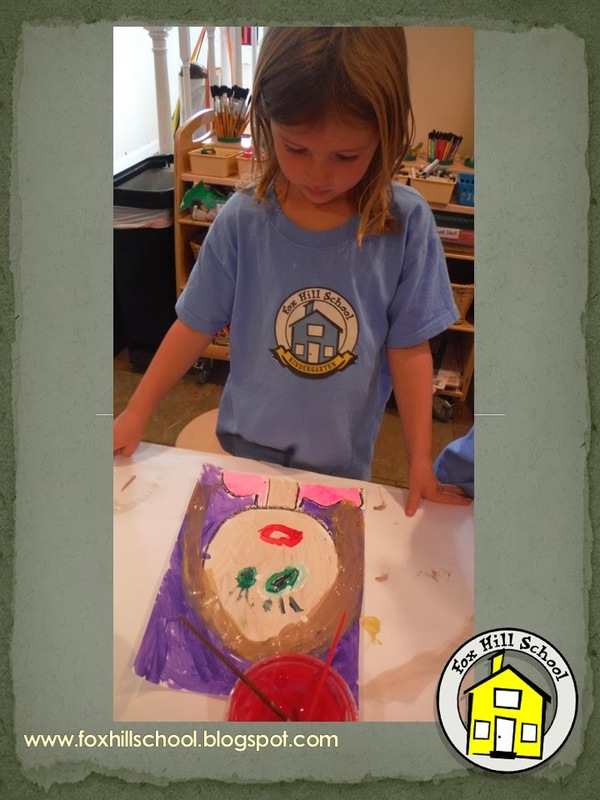 Then they folded the paper and pressed both sides together, opened it up to reveal the paint monster and added eyes, feathers and other embellishments that they stuck right to the paint to create their monster! 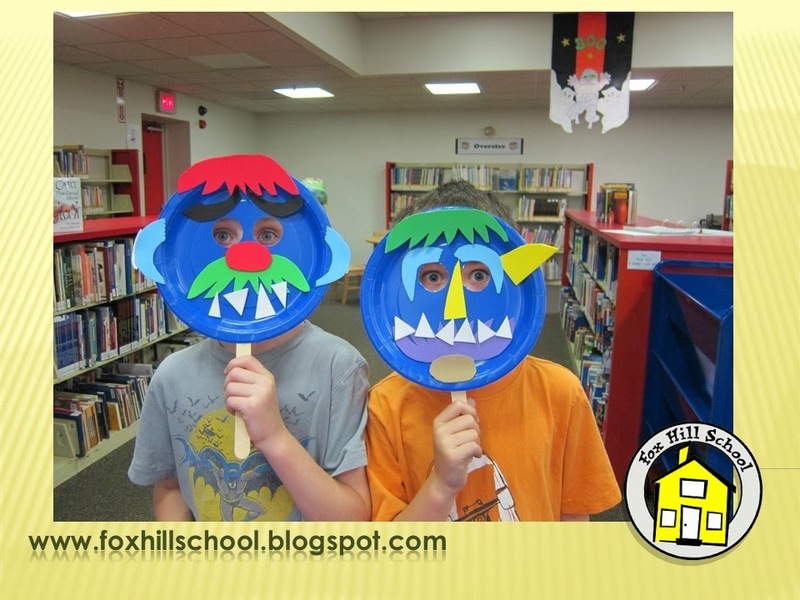 Mr. Czajak brought materials to create monster masks that look like the monster in his book! Paper plates, craft sticks and sticky-back foam cut into all sorts of fun shapes. His family came to help him man the mask making station! So fun! 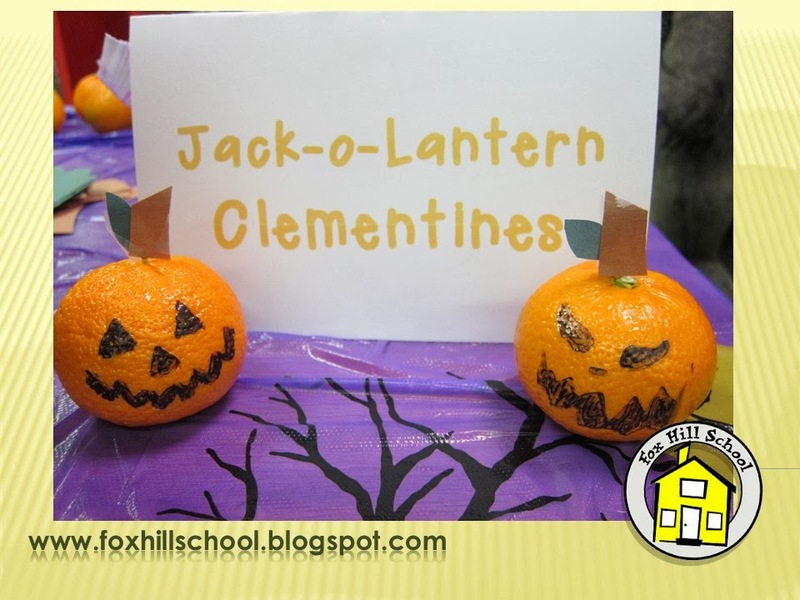 We provided Clementines, Sharpies, construction paper and toothpicks. 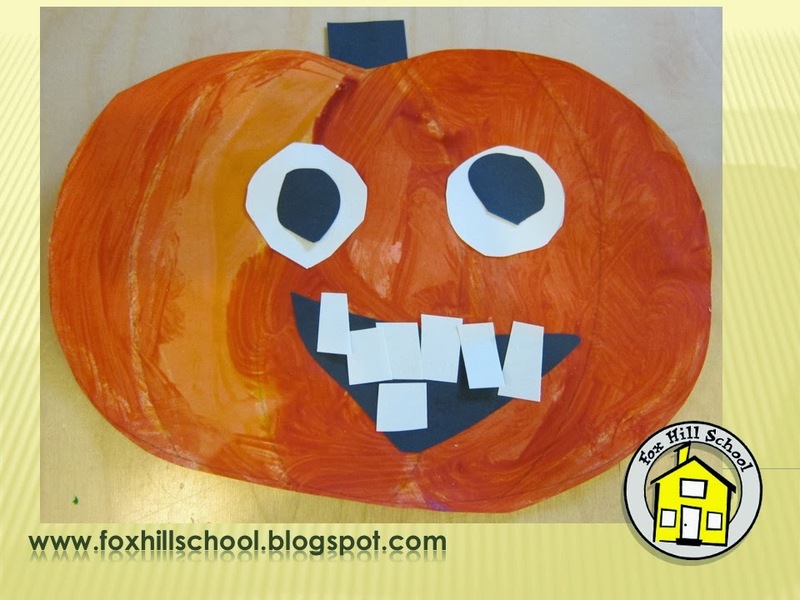 Kids could draw a face on the Clementine and add a stem and leaf if they wished! 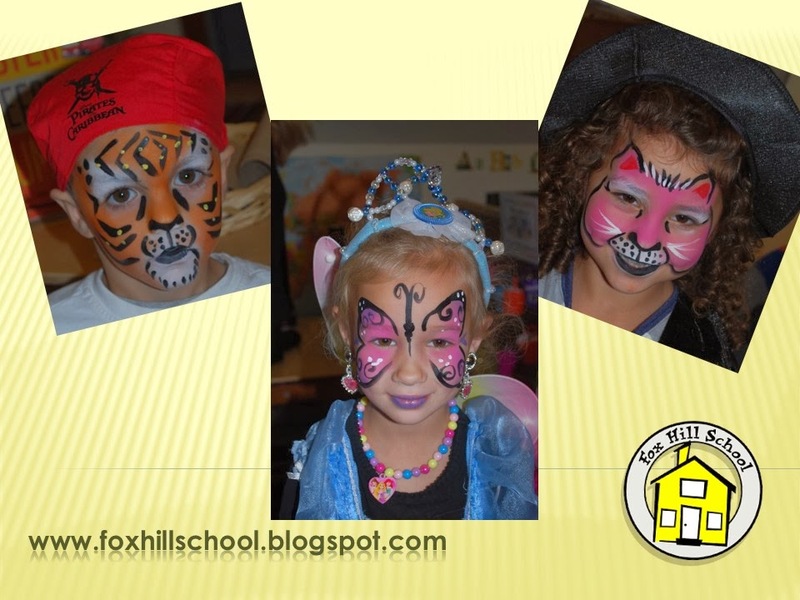 The Family Literacy Night was such a great way to spend time with the families at our school. We have Parent Collaborative meetings every month at our school, but we have decided that three times per year we are going to have a Family Literacy Night in lieu of our Parent meeting for that month. Thanks Fairy Dust Teaching for the excellent idea! Click below to see a montage of our incredibly fun evening! If you would like to purchase a copy of Monster Needs a Costume from Amazon, click on the picture below! Today is the 17th Anniversary of the opening of my first preschool. Unbelievable how time flies! I am truly blessed to be working with the most amazing teachers IN THE WORLD (no exaggeration!) 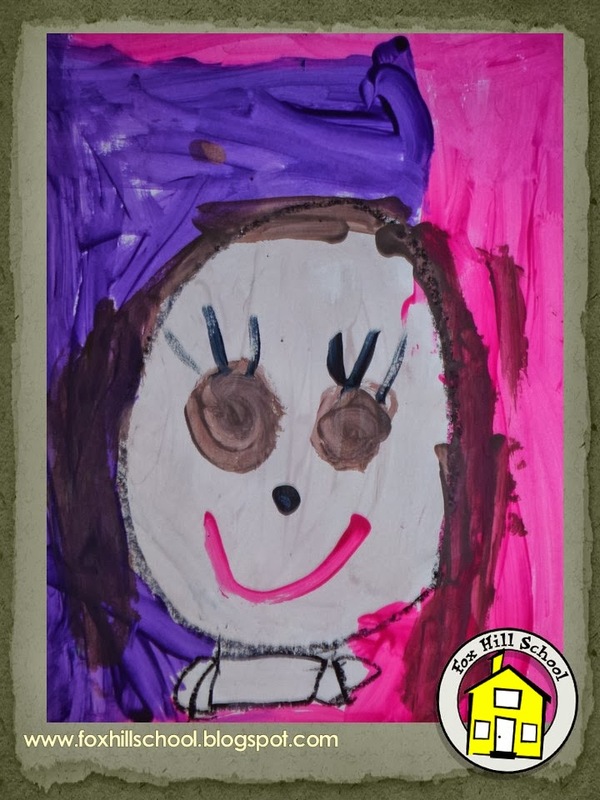 and families who trust us with their adorable, smart and funny children who bring us joy and laughter every day. Sometimes I meet people who ask "How do you deal with kids all day long and then go home to your own children?" Honestly, I can't imagine a life without it. What other job do you get to laugh and play and see how important your work is each day as the kids learn and grow? So thank you to everyone who has played a part in making our little school so special. Looking forward to another 17 wonderful years - at least! 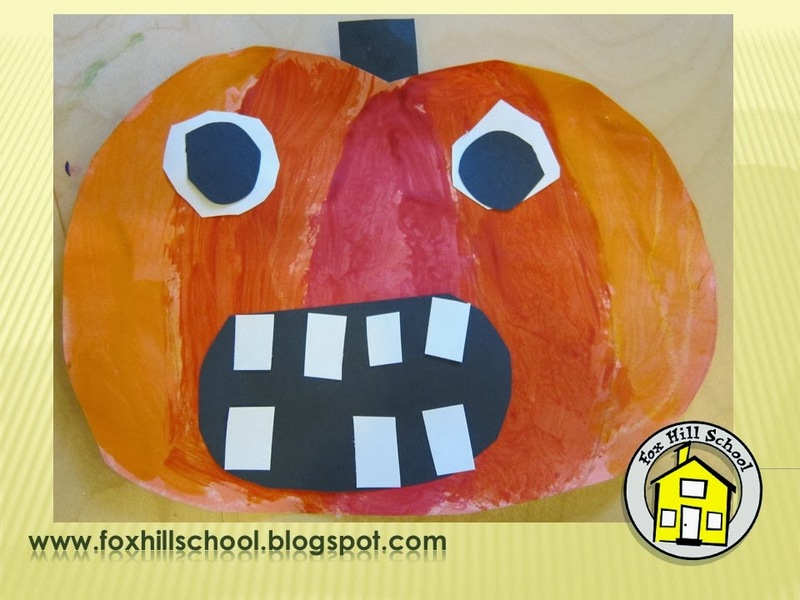 1.We penciled in the pumpkin outline and let the kids trace with white oil pastel. 2. We cut out the pumpkins after the kids painted them. 3. We gave the kids black and white paper and had them cut circles and rectangles as a separate activity and then the kids chose the shapes they wanted for their silly faces from what was cut by all the children. 4. Glue the face pieces with a glue stick instead of liquid glue. 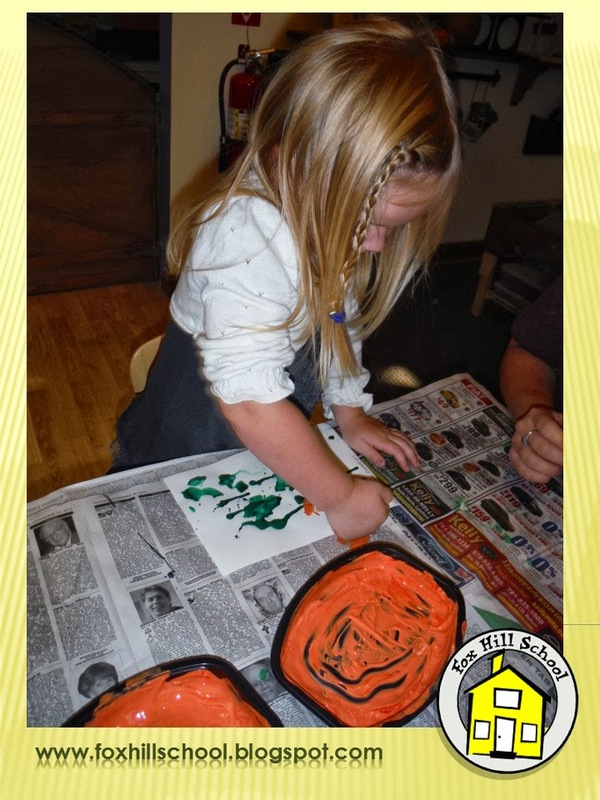 The drips from the liquid glue do not dry clear because the glue mixes with the paint on the pumpkin and turns yellow. 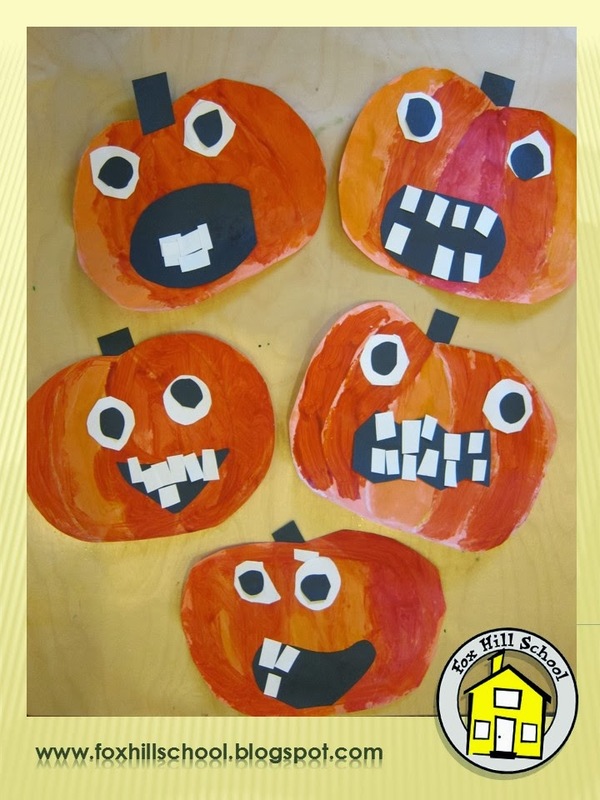 They turned out fantastic and we are using all the silly faces to decorate for our Halloween Spooktacular party later this week! 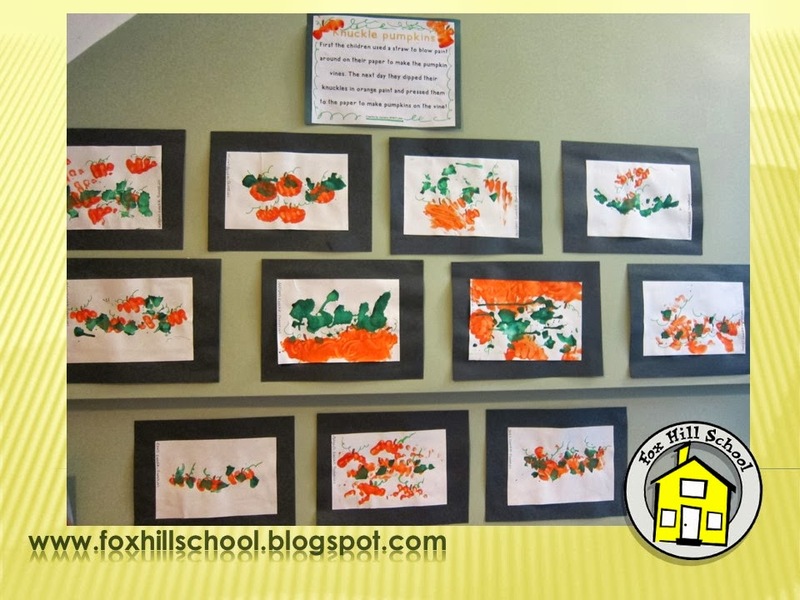 We combined two fun art techniques to create these cute little pumpkin patches! 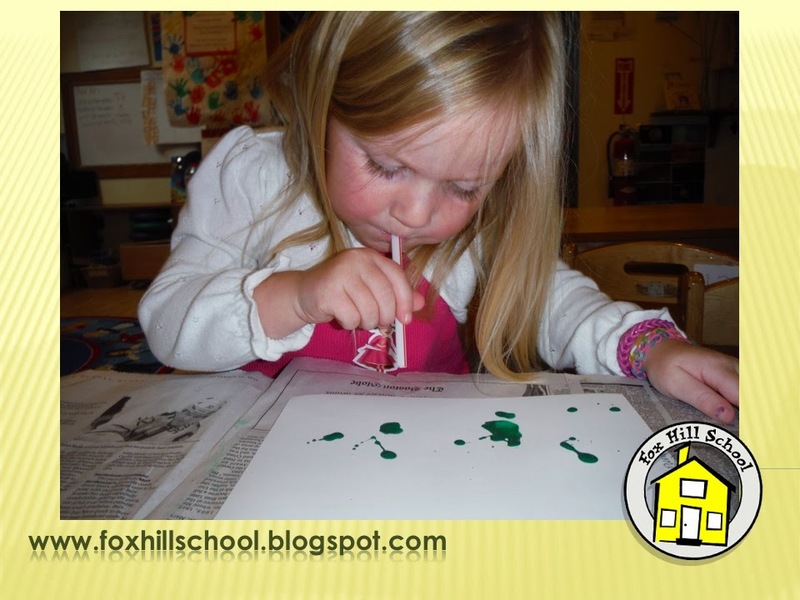 First we gave each child a straw and dripped some watered down tempera paint on their papers. 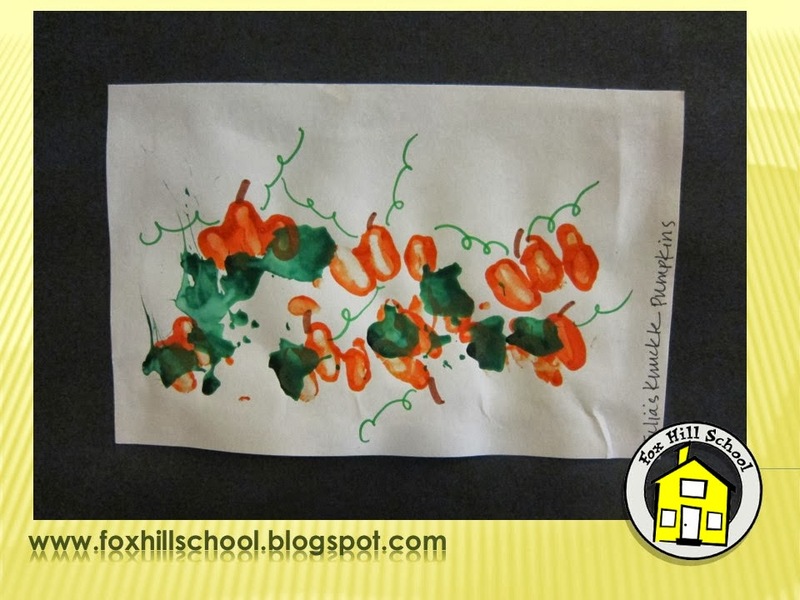 Then we asked them to use the straw to blow the paint around on their paper to create the pumpkin vines. Safety note: make sure each child uses their own straw. There is a good deal more spit involved with a 3-year-old blowing through a straw than you would expect! Moving on! 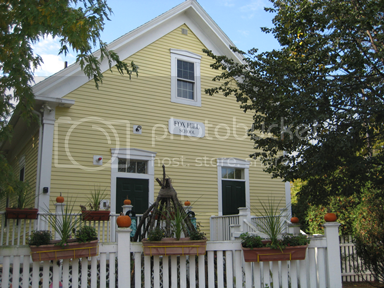 Once the "vines" were dry we had the kids makes fists with their hands and dip their knuckles into orange paint. 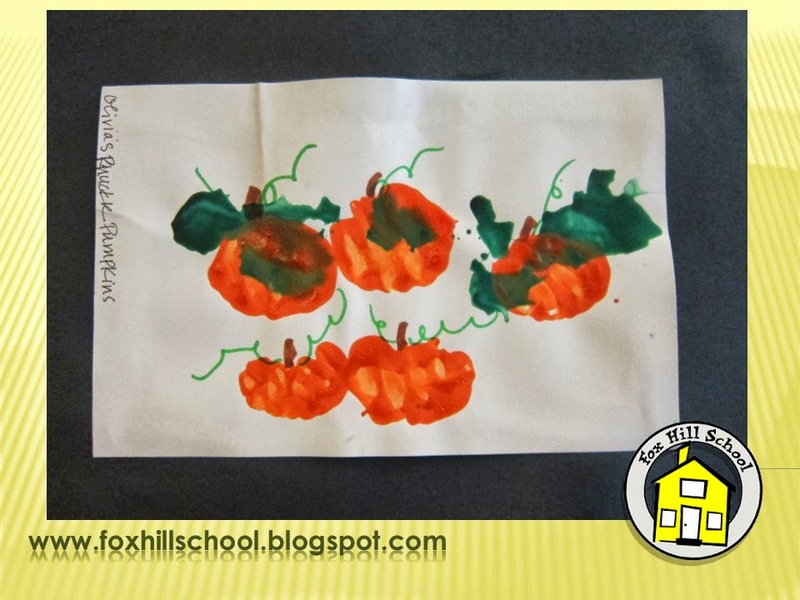 Then they pressed their knuckles onto the vines to make the pumpkins. 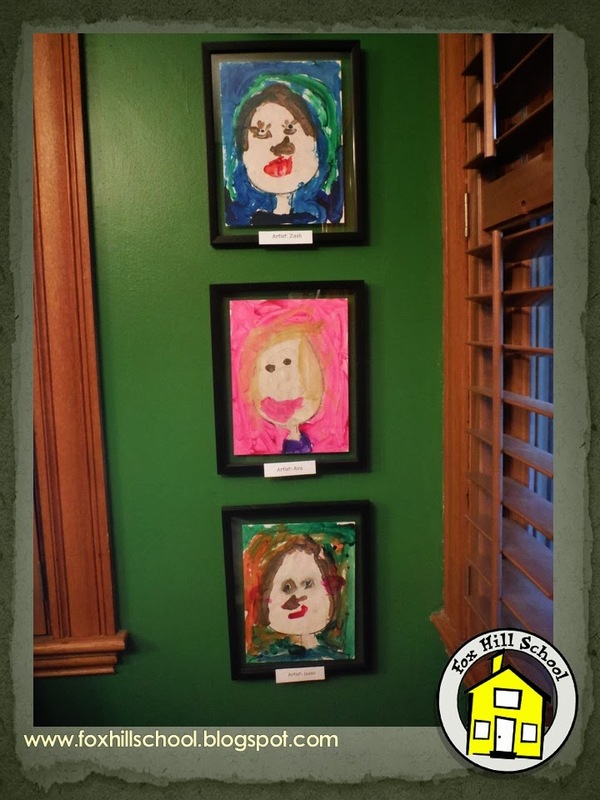 We framed the artwork with black construction paper and our pumpkins on the vine look fabulous hanging in the entryway! 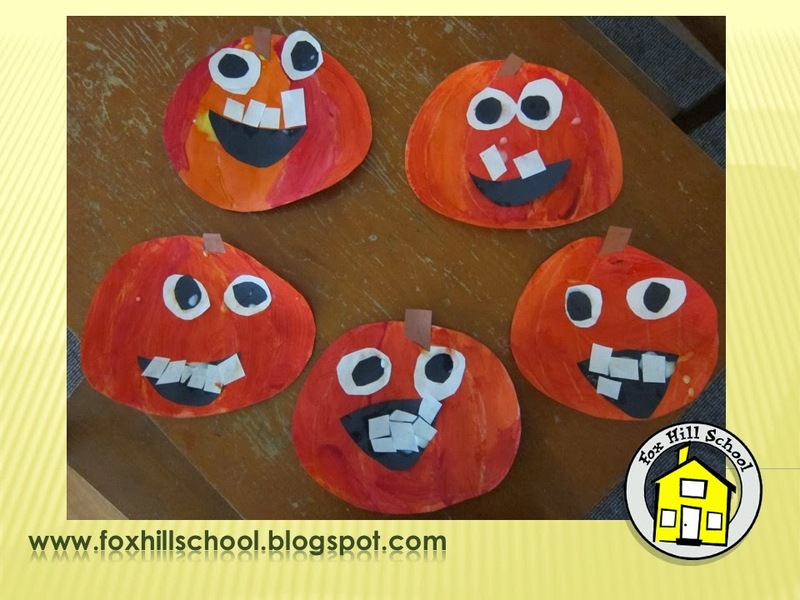 Here are some of our favorite pumpkin books that we read at the Fox Hill School. To purchase them from Amazon, click on the pictures below! 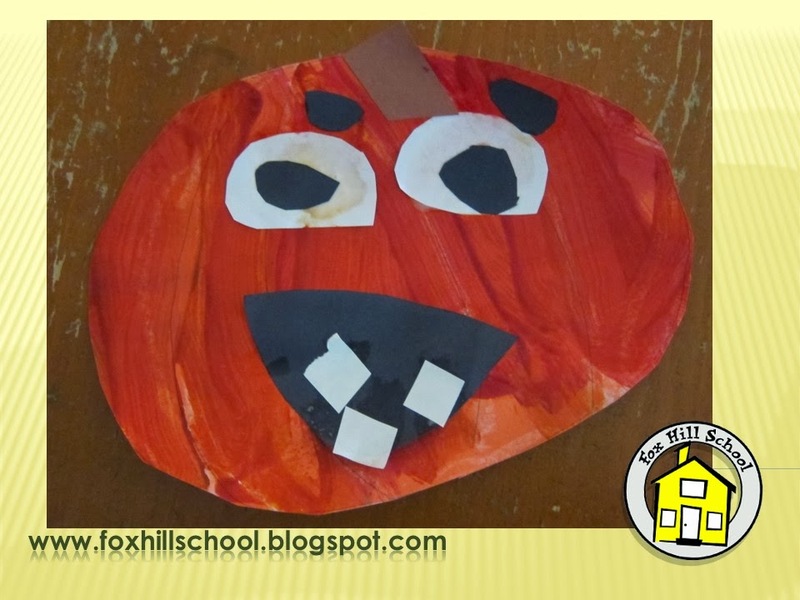 We created this simple game from a recycled egg carton, recycled plastic container and pumpkin seeds. 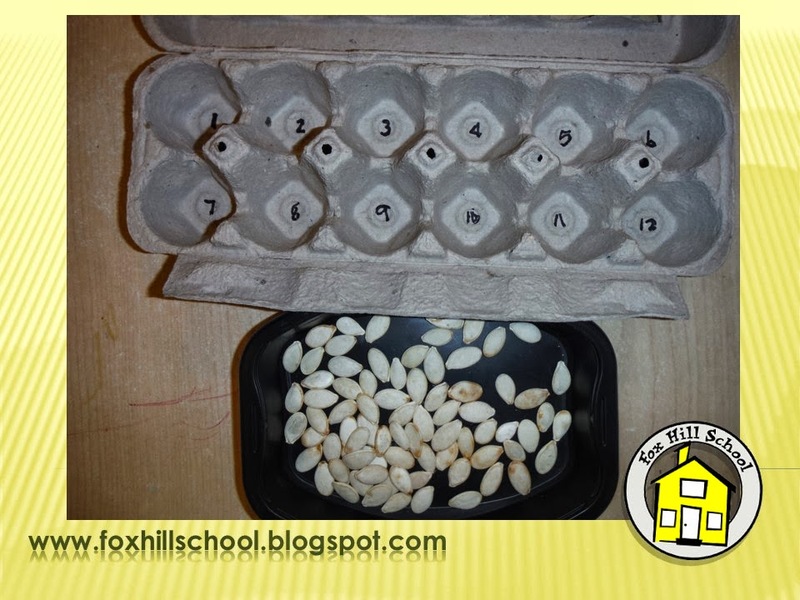 We wrote the numbers 1-12 in each section on the egg carton and asked the kids to look at the number and put that many seeds in the section. Easy peasy and they LOVED the game! Our budding math wizards could do this game independently and it was a great opportunity to sit with our friends who found it more challenging and help them with their counting. 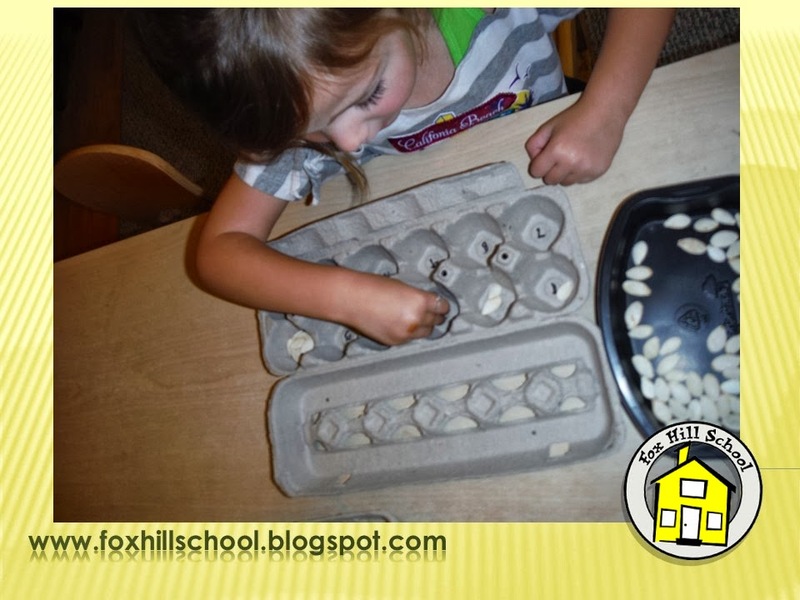 Everyday activities are a great way to incorporate the Common Core. 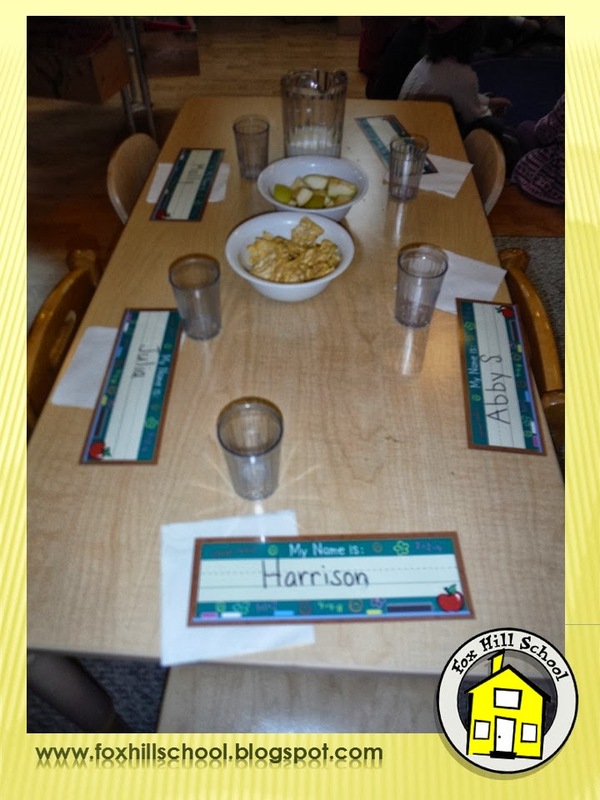 We have family style snack at our school so once we have set the tables with the snack choices, we place name cards at each chair and the kids have to find their name and sit there. Sometimes the name cards are written in all caps and sometimes we use upper and lower case so they will have an opportunity to see and learn their names both ways. Reading and Math: MD.MA.2 - Compare attributes for two objects & W.MA.6 - Using digital tools for communication. "What is as big as a pumpkin?" book! 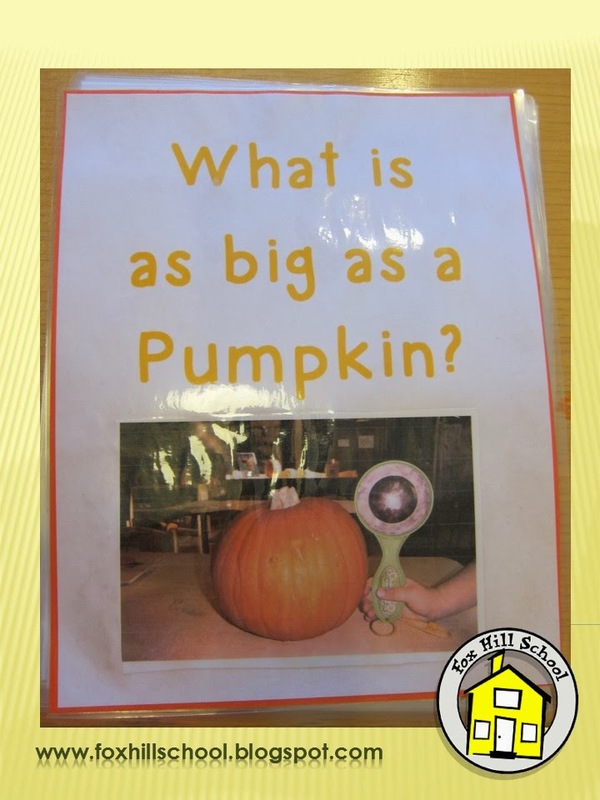 At free play we placed a pumpkin on the table and asked kids to collect things from our classroom and bring them over to see if the item was bigger or smaller than the pumpkin. Each time they brought over an item, we held it next to the pumpkin, compared the sizes and took a picture with the digital camera. Then we showed the kids that we can use the pictures to make a book for the classroom. We laminated the pages and secured them into a book with binder rings. We read the book at group and the kids were excited to see "their part" in the book. 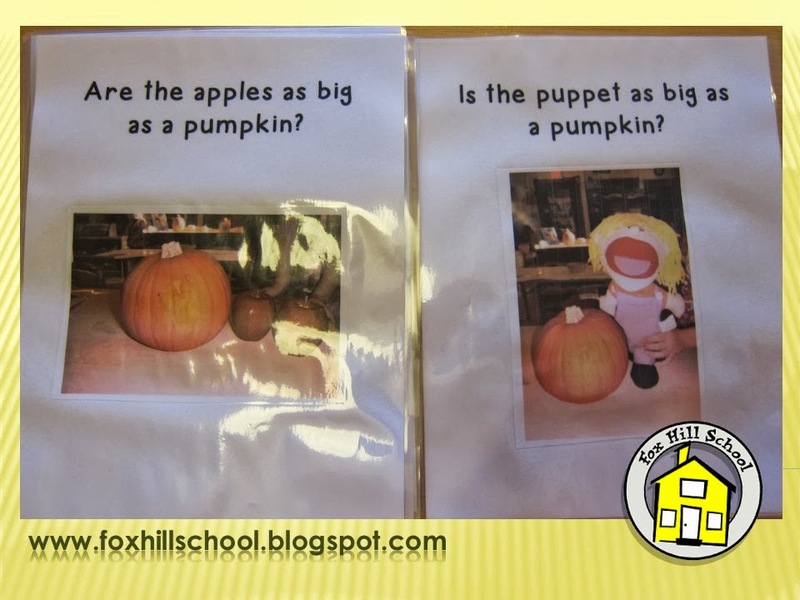 Since each page asks the same question "Is the (blank) as big as a pumpkin? ", they can look at the pictures and "read" the book themselves! These are all relatively easy and inexpensive ways to incorporate the Common Core in your classroom every day! 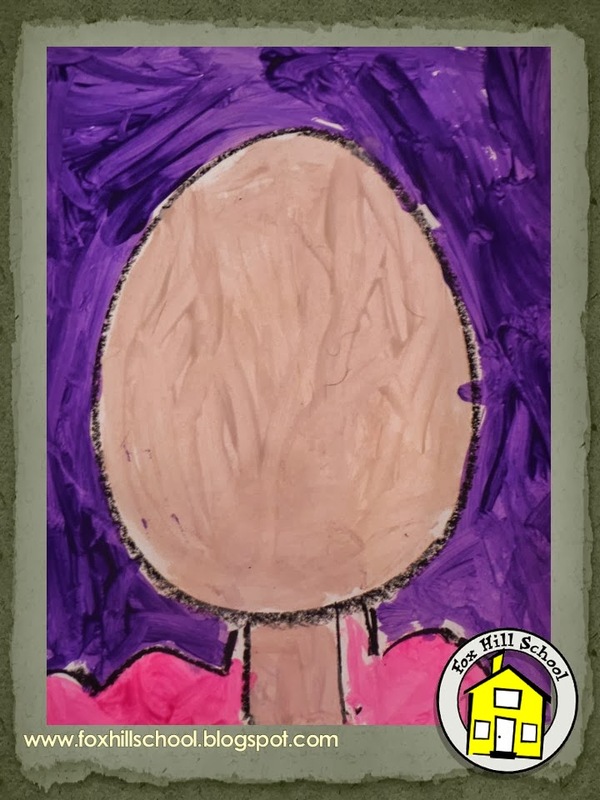 Each year in the Kindergarten I like to have the kids paint self portraits that will hang in the classrooms in frames. Then at the end of the year I have them paint another one to see their artistic progress. This year I tried something a little different that I learned from my art class this summer from Deep Space Sparkle. 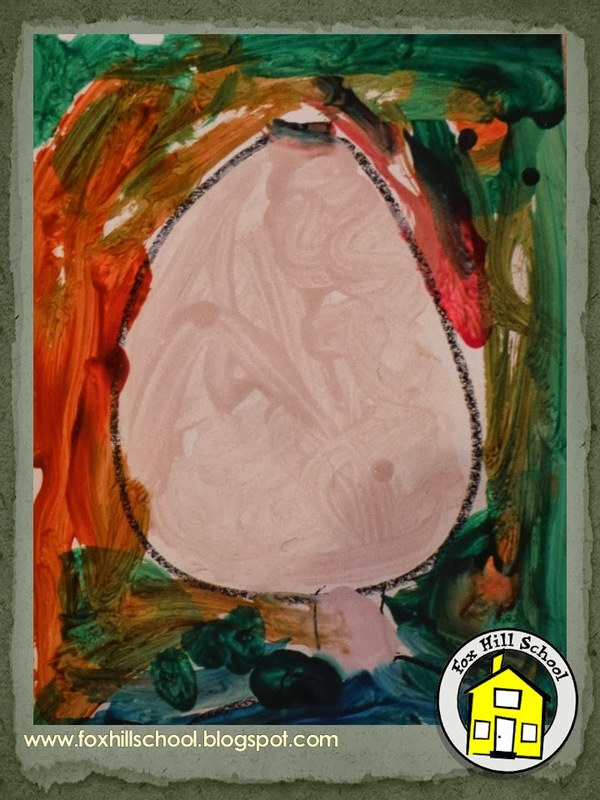 I started each child with a 9 x 12 piece of white Ultimate paper with an oval drawn in the middle in black oil pastel (having learned from my Rhyming Dust Bunnies project that they all draw things tiny) for the head. 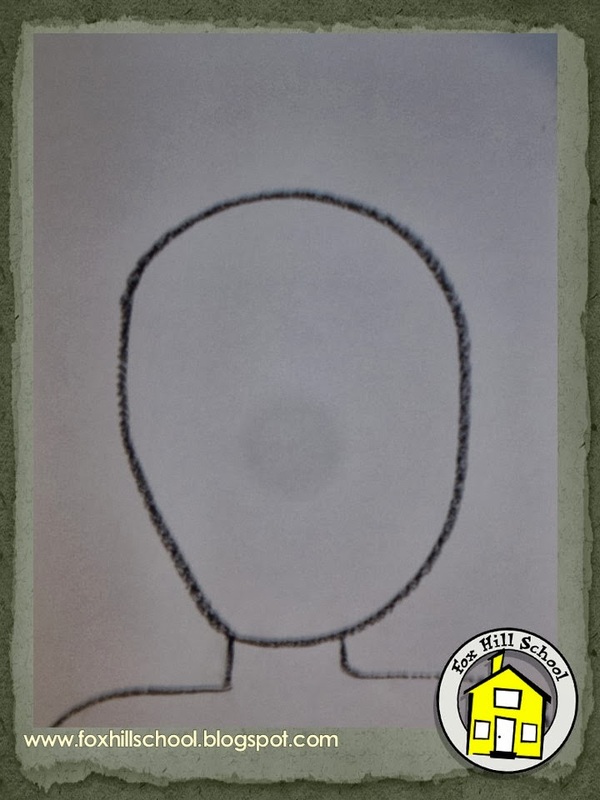 Then I had them draw the neck and shoulders on the head. Next they painted the background, the shoulders, neck and face. That took one 50 minute class time. 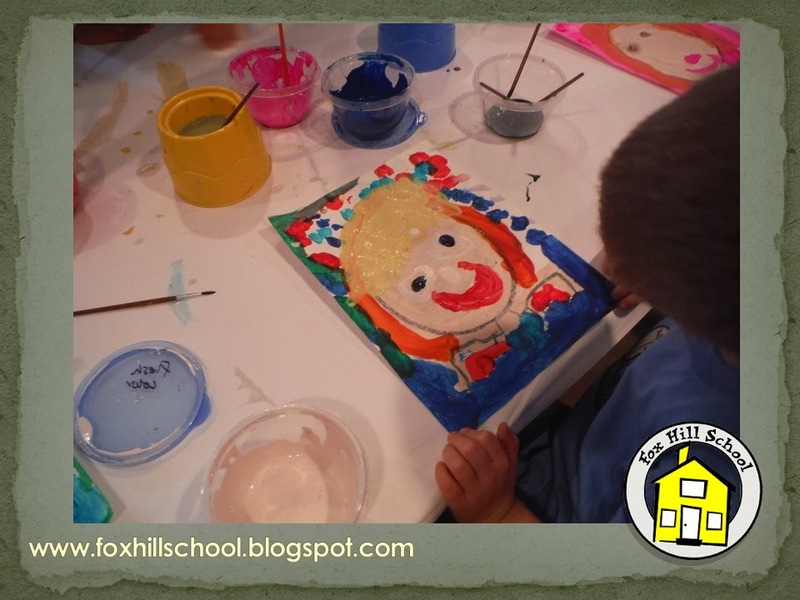 During our next art class I had them add the eyes, mouth, nose and hair. They came out great! 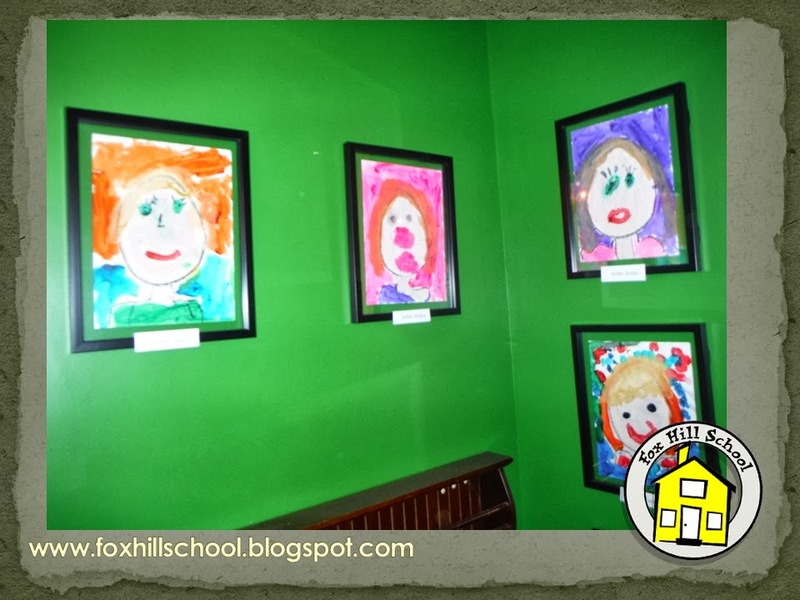 The paintings look fabulous hanging in frames in the classroom!